Humble Bundle has always had great deals, but this one’s a doozy. Sid Meier may be one the most well-known game designers in the business, since he puts his name on every game he’s worked on. Now, there’s a good chunk of his games available from Humble Bundle. 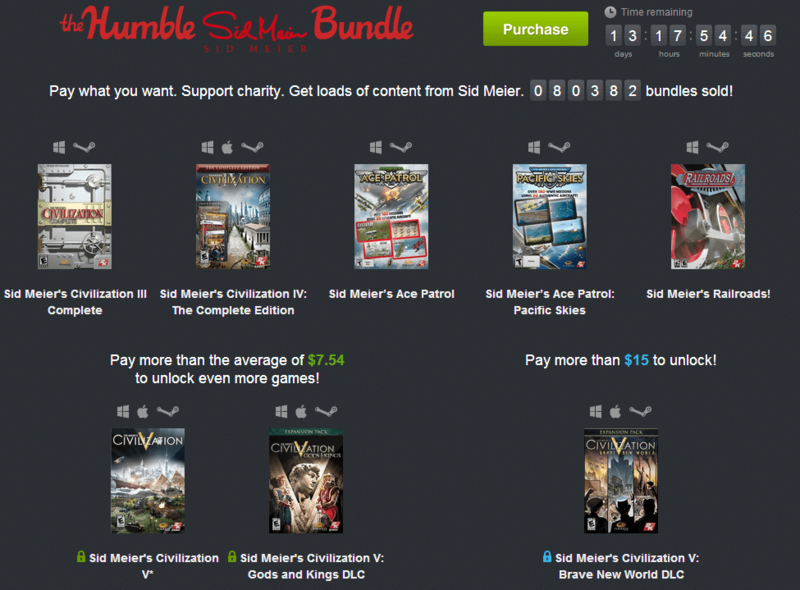 For those who don’t know, Humble Bundle puts up a selection of games that you pay whatever you want for. Now, it’s up to you, but the system is designed to give some of the money to charity. All of these are distributed as Steam codes. All support Windows; Civ IV, Civ V, and the Civ V DLC also support Mac OS. If, for some, reason you haven’t played a Civilization game yet, I highly recommend picking up the whole set if you can afford it. Any decent machine will be able to run the Civ IV collection, though your mileage with Civ V may vary.